FOSS Trading: Goodbye Google, Hello Tiingo! Google Finance no longer provides data for historical prices or financial statements, so we say goodbye to getSymbols.google() and getFinancials.google(). (#221) They are now defunct as of quantmod 0.4-13. Thanks to Steve Bronder, getSymbols() can now import data from Tiingo! (#220) This feature is part of quantmod 0.4-13, which is now on CRAN. Windows and Mac binaries should be built in a day or two. Tiingo is a web service that provides tools and data for financial analysis. 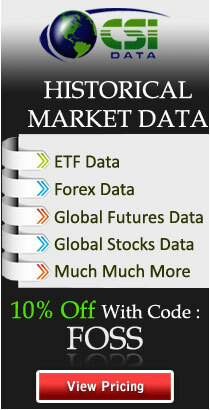 They provide daily price history for US stocks and ADRs, Chinese stocks, Mutual Funds, and ETFs. There is up to 30+ years of history, including raw prices and split/dividend adjusted prices. All this data is accessible for free, with reasonable symbol and bandwidth limits. All you need to get started is a one-time registration for an API token. You should see your API token just above the beginning of the metadata section, after logging in, of course. Tiingo has a well-documented daily price data API that returns either JSON or CSV. Where you replace "[your key]" with the API key you receive after registration. You can use setDefaults() to set your API key one time, and use it for all getSymbols.tiingo() calls. saveChart() actually saves charts now (#154). Brilliant!